Did Johnny Depp Do It in the U.K.? 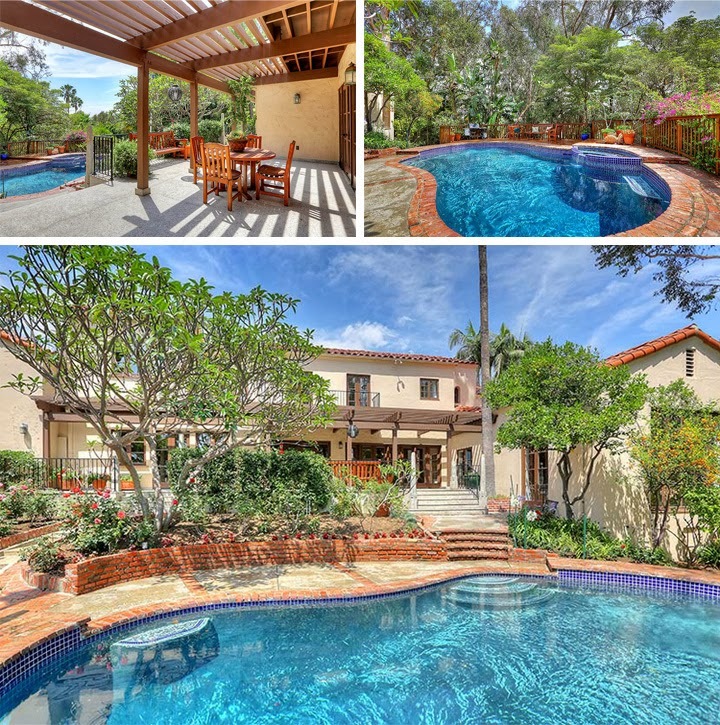 Texas Bidnessman Bobby Patton Buys in L.A. YOUR MAMAS NOTES: The deal went down last September (2013) but Your Mama didn't hear about it until this last weekend when real estate yenta Yolanda Yakketyyak let the celebrity real estate cat out of the bag—and good ol' Lucy Spillerguts quickly seconded the motion—that actor/comedian George Lopez dropped $2,675,000 for a 1920s Mediterranean in the celebrity approved foothills of L.A.'s Los Feliz area. In addition to his high-octane stand up comedy—much of which deals with the Latino experience in the U.S.—Mister Lopez has a long list of Tinseltown credits. In the early- to mid-Aughts he starred in an eponymous sitcom (George Lopez) and, after that was cancelled, he hosted a short-lived late night talk show (Lopez Tonight). He's been in a bunch of movies and television programs—most of which we've never heard of before, voiced a Chihuahua in the Beverly Hills Chihuahua movie franchise and a Toucan in the animated movie Rio, and he's currently in production on a new (and not yet airing) sitcom called Saint George. Digital marketing materials Your Mama dug up online show the walled and gated residence sits on almost one-third of an acre with four bedrooms and 3.5 bathrooms in approximately 4,100 square feet. 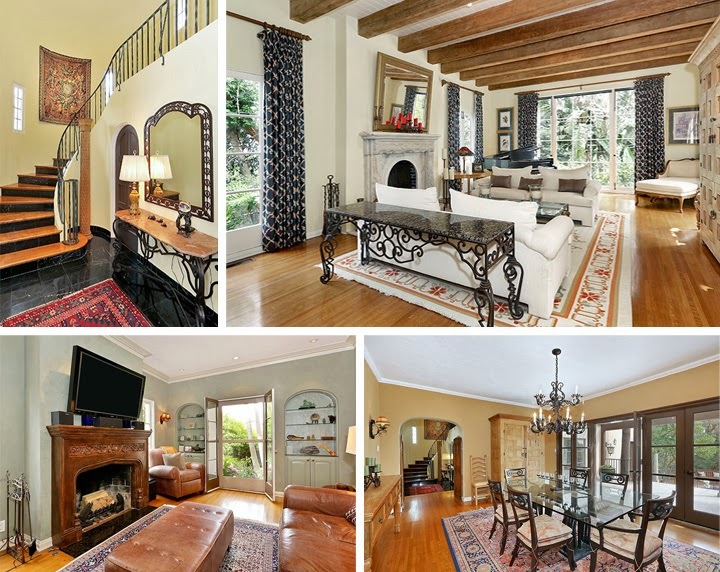 The interiors retain some of its original detailing (coved ceilings, wood floors, wrought iron railings, multi-paned windows and French doors, etc.) but the kitchen and at least some of the bathrooms have been done over in the most banal if expensive manner in mono tonal assortment of beige, sand and brown. The front door opens to a small but voluminous double-height foyer with questionable (but workable) black marble tile flooring and a tightly curled curved staircase with wood treads and black marble risers. Straight ahead is a spacious step down living room with narrow gauge hardwood floors, a fireplace with carved stone mantelpiece, rustic exposed wood beams on the ceiling, and large windows and French doors on three sides that fill the room with direct and ambient light. The roomy formal dining room sits a couple steps up from the foyer and also has wood floors and a full wall of French doors that open to a pergola-shaded terrace that overlooks the swimming pool. A den offers up a second fireplace—this one with a less impressive stained wood mantelpiece and surmounted by a large flat screen television—and a built-in wet bar set between inset arches with glass display shelves. The eat-in kitchen is commodious enough and certainly well equipped with the usual collection of of higher-grade appliances including a six burner range plus double ovens and two dishwashers but is also a tone on tone study in brown and beige. 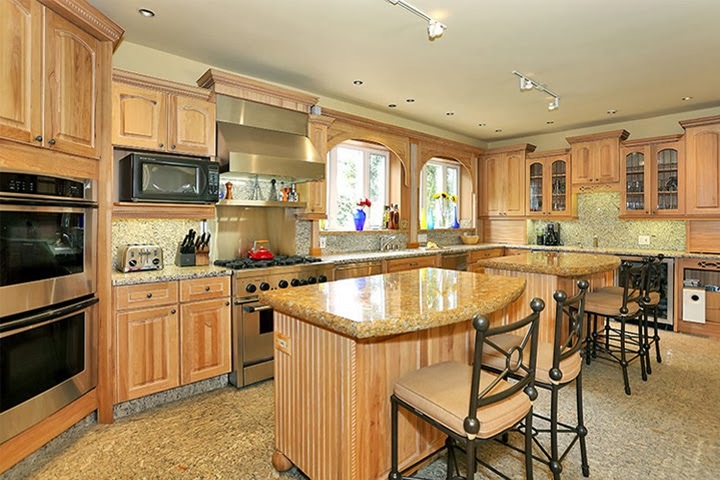 There are two center work islands (when Your Mama thinks one big one would have been a much better solution) as well as a long and slender breakfast area with track lighting and French doors that open to a barbecue terrace. There's a separate mud/laundry room with built-in cabinets (that matches the kitchen cabinetry) and a spare fridge/freezer and, somewhere up in there, listing photos depict one of the more ticky-tacky wine cellar and—ahem—tasting room Your Mama has ever had the misfortune to lay our jaded real estate eyes upon and we can only hope and pray that Mister Lopez had (or has) the finances and good sense to call in a nice gay or lady decorator to work that hot mess out. A main floor guest/family/staff bedroom has an attached (or nearby) bathroom and two more bedrooms on the upper floor share a vintage (or vintage inspired) hall bathroom. 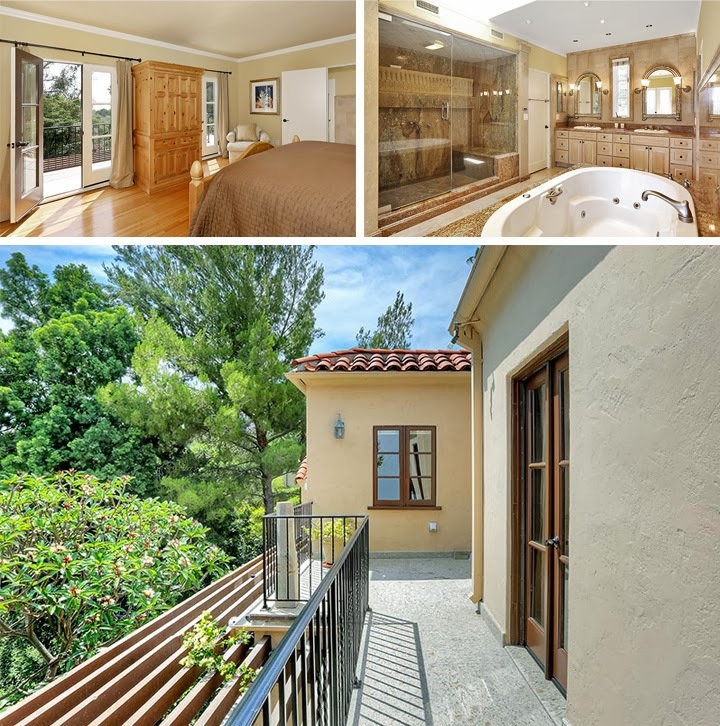 The master suite, also on the upper floor, has an adjoining office, balcony access through French doors, a pair of walk-in closets, an oppressively beige (if luxuriously outfitted) bathroom with double sinks, spa tub and separate, over-sized steam shower. The aforementioned pergola shaded dining terrace off the living and dining rooms steps down through terraced planters to an kidney-shaped swimming pool and attached spa surrounded by brick and concrete terracing and shielded from the prying eyes of neighbors but a thick and tall wall of foliage. 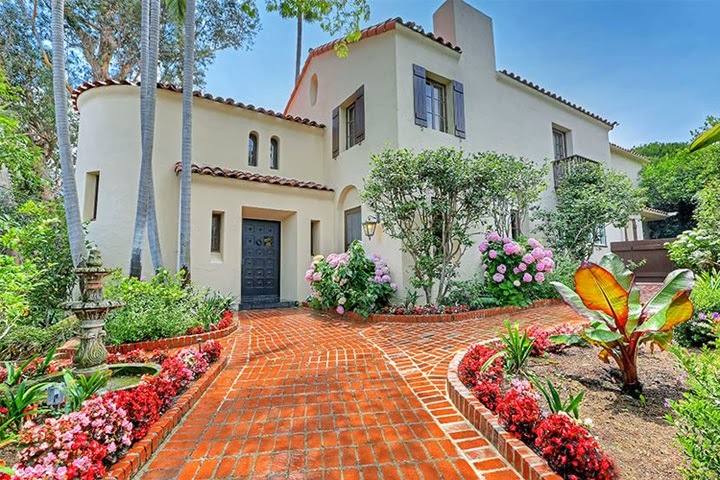 Previous to purchasing his new(ish) home in Los Feliz, Mister Lopez lived with his wife and daughter in a walled and gated five bedroom and five bathroom Spanish-style house in the affluent (and star-studded) Toluca Lake nabe. Property records show they purchased the place in May 2004 for $2,495,000 and that he deeded the residence over to his ex-wife, Ann, shortly after their divorce was finalized in mid-2011. (Some might say giving her the house was the least he could do since, in 2005, she gave him one of her kidneys. 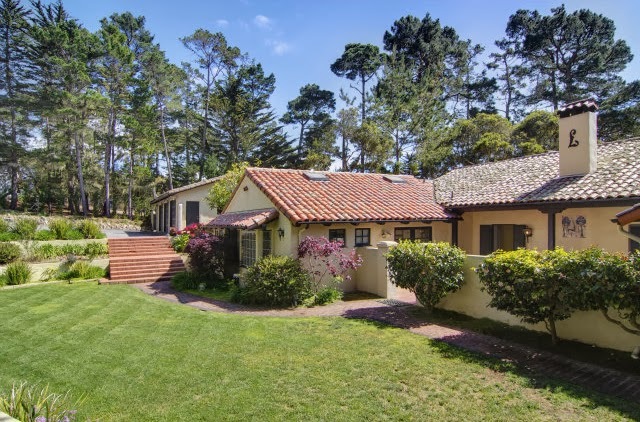 Anyhoo...) In March 2004 the former couple coughed up $3,050,000 for a four bedroom and 5.5 bathroom 1920s Mediterranean just above the famed 17 Mile Drive in Pebble Beach, CA, (above) that property records reveal was quietly sold off at at a spine-tingling loss in September 2012 for $2.6 million. I thought he bought a house from Eddie cibrian and Brandi with an I in encino a long time ago? I abso love this home. Price, location and style. EXCEPT the Home Depot, it's on sale! !kitchen redo. Damn gurlfriend, tear that out el pronto. Double wides have better kitchens that that horrid thing. has Kirstie invited him over for tea and crumpets yet? cocktails, perhaps? 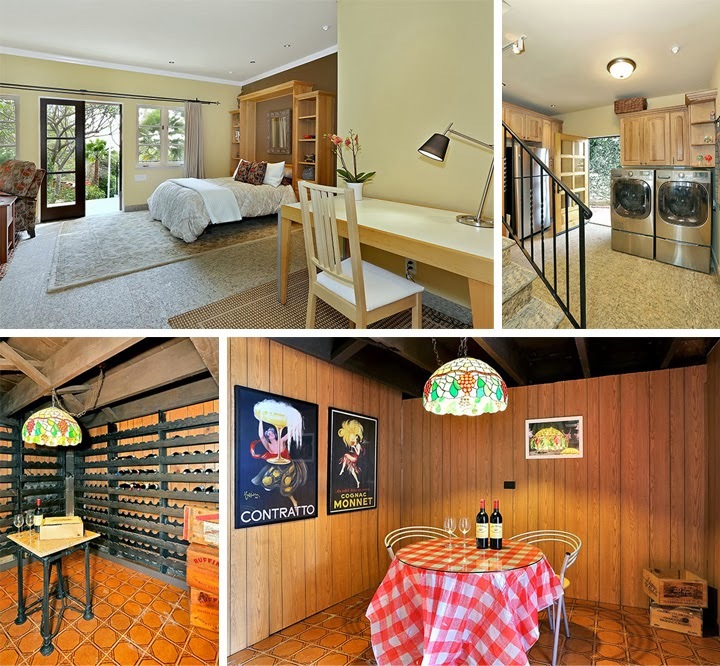 Nothing that cannot be remedied here; a good gut reno on the kitchen & baths, and ripping out that atrocious Congoleum flooring (and the Home Despot paneling) in the "wine tasting" room, would be a good start. Never found Mr. Lopez particularly funny, but one has to admit he's done well for himself; here's hoping he doesn't wind up like this. I'm sure he sees past the warts. There's a site online that has 65 pics. It's pretty charming. I like the house but I can see what everyone is saying about the "wine tasting room". It is so bad, makes me wonder what they are covering UP ? ?